Where Chris Runs: It's like cooking a steak. It's been an educational few weeks, running wise, at least. 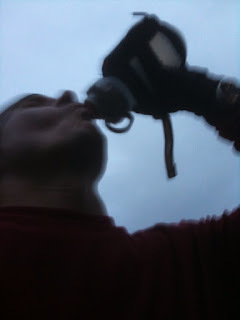 I had a goal to lower my 10k PR of 44:20 during the first three months of 2010. I am aware of the fact that at 46 years old, PR's at any distance are going to be more and more difficult to come by as the years pass. I only scheduled 10k's for January, February and March. I had a few decent races, and passed up a race, and now, here I was, nearing the end of March and no PR. thing seemed set up for a good race on Saturday In Alton Baker Park in Eugene, one of my favorite places to run. and we talked through calling insurance, police, tow truck etc. I got off the phone, explained to Jeanne what had happened, then sat down in the car, paralyzed with indecision. Should I drive back, and hour and a half, right away? I called him back, he had made all necessary phone calls, assured me he was ok physically, and that the neighbors to the house he hit were being very helpful, I heard them in the background ask if he wanted some hot chocolate, and decided I was still going to race. The race official announced 10 minutes til start time as I was putting my racing flats on. I quick run to the bathroom with number and pins in hand, then ran to the start line, arriving just as they announced 2 minutes to go. My only option to was to line up on the first line, I finished pinning my number on with 30 seconds to go. Despite telling myself not to get caught up in the speed of the start, I still went out way too fast. A mile in and I'd done just about everything wrong that could be done. Emotional, no warm up and out too fast. Then I did something that only good training allowed me to do. I calmed down, slowed down a little, let my training do the work for a few miles and regrouped for a strong finish and a new 10k PR of 43:48. Nathaniel is fine, thankfully, his son Elliott was not in the car with him. 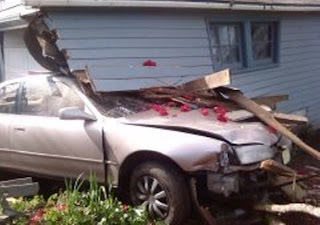 His car, and the garage he drove through are not so fine. I hate feeling grateful for insurance.....but. 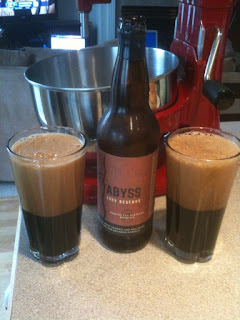 I have been saving a bottle of The Abyss to celebrate a distance PR and Nathaniel came over to enjoy it with me. And so, my cooking a steak analogy. I take a lot of pride in my cooking abilities, heaven knows I'm a better cook than runner. When someone praises a steak that I've cooked, I'm quick to give all the credit to the cow. "You can certainly screw up a good cut of meat, but it's hard to save a bad cut of meat". And I think it's also true, that you can be well trained and still mess up a race, but it's hard to be poorly trained and race well.